The village has an extremely active History Group with a splendid website containing many images and stories of the village in bygone years. Click to the History website. The first, 'Richard Willowes – Vicar of Meldreth, 1692-1736' by W.M.Palmer, 1924, as well as listing incumbents of the village church (Holy Trinity) from 1189 to 1894, gives a fascinating picture of village life through the various village accounts. The Church Warden accounts, 1694 to 1735, were meticulously kept by Willowes and contain intriguing data on church and consumer items of the period, poor relief, fire damage recompense, transport, grain prices and labour costs, etc..
Again, through these and other account records of the time, we have a picture of the duties and expenses of local officials such as overseers and constables. There is even a section on prices of cottage building, 1722, and the book shows what taxes were levied on ordinary people, how they were collected, and by whom. In 1714 there was even a village revolt against the payment of a tax no one could see the reason for although, according to records, it had been paid regularly since 1249! The villagers commissioned research in London and Cambridge, and were still complaining in 1858 . Eventually they discovered that they were paying a so-called Lark-Silver tax in lieu of making a present of 100 larks for the Earl of Clare's Christmas dinner! One might speculate whether this tax is somewhere still hidden in the parish precepts! The second little book,'The early history of Meldreth' by D.R. Mills, published in 1965, was revived in leaflet form for the Millennium Year 2000 and covers what is known about the village and environs up until the mid 16th century. Dr Mills lists Mr Palmer's 'Vicar of Meldreth' book as a reference among several other items of local archive. Mrs Sara Butler is the author of the 3rd book called'Meldreth Village'. This is in 2 parts written in 1972 & 1978 and has a wealth of very interesting details of village life through the eyes of one who actually lived in the village in the early 20th century right up to well after the 2nd World War. Although published some time ago, the books are still available from the Cambridgeshire Libraries. For an insight into Meldreth's past they take little time to read and can be well recommended. In 2008 an ancient document from the year 1438 came to light in a London dealership regarding land conveyance in Kneesworth, Meldreth and Whaddon. 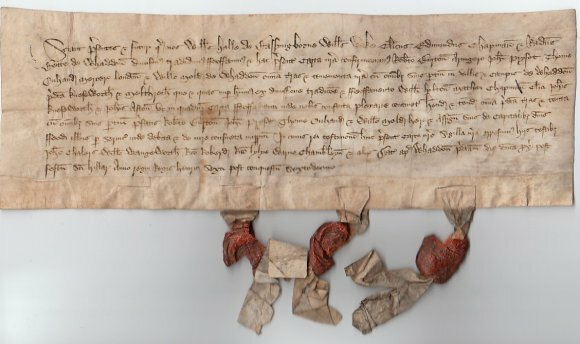 With the help of Cambridgeshire County Council's Principal Archivist, Philip Saunders, the document was jointly acquired by the three parishes and will be kept in the county archives. For those interested in knowing more, detailed notes, in pdf format, can be downloaded here.